When it comes to open ocean fishing, few prizes are as uniquely entrancing as the Dorado or ‘dolphin’ fish. Often referred to as mahi-mahi, this exquisite creature is around a meter in length and covered with dazzling blue, green and golden scales. If you’re on the hunt for spectacular gamefish, there’s truly nothing better than learning how to catch mahi-mahi. Before we start, it’s important to know that mahi-mahi is known by several different names. Mahi-mahi, Dorado and dolphin fish are the most common. If you’re planning to consult a guide or local fishing expert, know they may use any one of these names. Generally speaking, you’ll hear Hawaiian locals use ‘mahi-mahi’ and people closer to Mexico use the word ‘dorado’, which means gold in Spanish. Let’s take a look at some interesting facts and learn how to catch mahi-mahi in the open ocean. Despite having a lifespan of just five years, the adult mahi-mahi is a sizeable fish with a large, torpedo like body designed for shooting through the water at high speeds. The species is caught for food as well as sport. Mahi-mahi meat is white, firm and slightly sweet so it lends itself well to baked and grilled fishes. The average mahi-mahi grows to around one meter in length and a weight of anywhere between 15-30lbs. While fish double this size have been caught before, their short lifespan means really these big specimens are rare. It is worth noting mahi-mahi is prized not just for its meat. It also has a spectacularly beautiful appearance when out of the water. Where Is the Best Place to Fish for Mahi-Mahi? Mahi-mahi can be found in warm, tropical waters all over the globe. However, some of the most popular fishing sites are in North America, the Gulf of Mexico, along the Pacific coast of Costa Rica, around Southeast Asia and along the Hawaiian coast. We’re going to focus on fishing in North America, particularly offshore between Florida and New Jersey and in the Gulf of California. Although mahi-mahi is an open ocean fish, it spends most of its time on the surface. It feeds just under the waterline and uses floating debris as shelter from predators and the heat of the sun. It is especially fond of a floating weed called sargassum. When hunting for mahi-mahi, the trick is to locate its hiding places. Look for floating clumps of sargassum. Look for logs, brush, anything large enough to hide a big fish. Once you’ve found a likely hiding spot, it’s as easy as casting your lure and waiting for a curious fish to poke its head out. There are plenty of tips and tricks for learning how to catch mahi-mahi but, in truth, the most useful tool is patience. They’re not particularly hard to pick up as long as you have the right equipment. Let’s take a look at that now. What Type of Equipment Do I Need to Catch Mahi-Mahi? While mahi-mahi are sizeable, they don’t come close to beastly saltwater game like marlin. You’ll often find charter boats and guided expeditions fishing for both species at the same time, especially in Florida waters. It means, in these areas, mahi-mahi are commonly caught with heavy duty equipment. And it works just fine. The problem is, you lose a lot of the fun when your fish can’t fight back. Mahi-mahi put on a spectacular show if you give them enough wiggle room. They fight the whole way and, for open water enthusiasts, it’s a natural spectacle that’s worth extra effort. With that being said, you don’t want to head out with a super lightweight rod either. Getting the balance right is an important part of learning how to bait, catch and reel these guys in. We recommend using a braided line weighing anywhere between 20-30lbs. Use a saltwater cashing reel and, if possible, a 7ft rod (or as close as you can get). Certainly, don’t use a fishing rod under six feet in length. Braided line is a great option because it is smaller in diameter. This will enable you to place your baited hook much closer to the mahi-mahi’s favorite hiding spots. When it comes to baiting, it’s equally important to pick the right type of hook. For catch and release trips, try to use a circle hook, rather than a J hook. It’ll give your fish the best chance of survival once they’re off the line and back in the water. We recommend a 4/0 to 7/0 circle hook for catch and release fishing. If you’re fishing for food, a J hook of the same size should suit your purposes. What Techniques Can Be Used to Snare Mahi-Mahi? There are two ways you can catch mahi-mahi out in the ocean. You can troll for hungry fish – with bait or a lure moving steadily behind your boat – or you can do it the traditional way by placing bait close to surface hiding spots. We’re going to focus on the latter as it is, arguably, the more authentic experience for first timers. 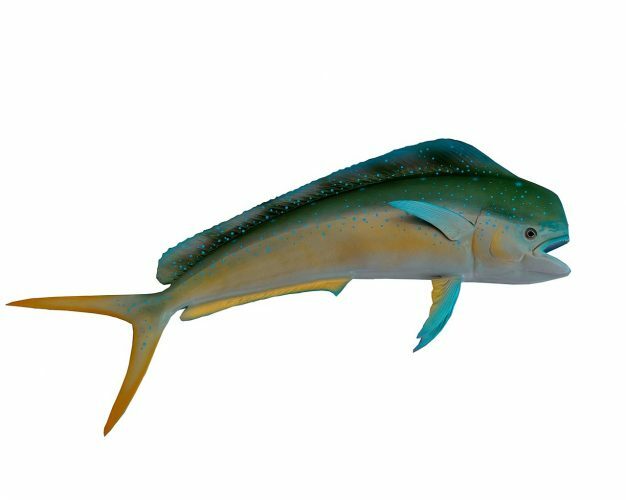 Some common types of bait used to catch mahi-mahi are diced ballyhoo, live shrimp, squid and sardines. To set your trap, take a portion of bait fish and run a 4/0 to 6/0 live bait style hook through the middle. Make sure the hook is firmly connected to your braided line and saltwater reel. We recommend starting with around 15-20ft of leader line. It might feel overly long at first but, if your line weakens at any point, you can snip a few inches off and retie. First, identify a suitable hiding spot; somewhere you think a mahi-mahi fish might be hiding. Pick up a handful of bait and gently toss it into the water at this location. Wait for the fish to poke their curious heads out and feed on the bait. Then, carefully float your baited hook out while keeping the fish interested with a little more chum. To maximize your catching area, add 1-2oz of weight to one line along with a float approximately 30ft up its length. This is a relatively easy way to expand your depth using multiple lines. Some will cover the surface and others down to around 30ft. If nothing seems to be biting, throw one or two more handfuls of chum into the water. Wait. If you can’t see any activity, it’s time to try another spot. Not only do mahi-mahi taste delicious, they are dazzlingly beautiful out of the water. With iridescent scales of blue, green and gold, they’re really quite a sight. Whether you’re catching and releasing or keeping them for food, make sure to get a good look at your catch. These fish change color out of the water; their scales transition through several different tones as they get closer to death. We’ve covered just one way to catch mahi-mahi, with standard equipment and a fairly straightforward baiting technique. If you’re planning to troll for fish with a moving lure, you’ll need to get the speed right. Try not to spin or skip your lure in an exaggerated manner. Move at a speed that allows your bait to float just under the surface. Most importantly, have fun because learning how to catch mahi-mahi is a real adventure!